Power plant boiler houses designed to burn coal or high sulfur oil are required by Federal and State pollution regulations to "scrub" (remove) sulfur dioxide from flue gasses to meet emission limits. SO2 in flue gasses is known to be harmful to the environment, as it is one contributor to the formation of acid rain. pH control is critical for the proper functioning of the scrubber system. Flue gas desulfurization (FGD) technology, is commonly referred to as a scrubber, is proved and effective method for removing sulfur dioxide (SO2) emissions from the exhaust of coal-fired power plants. The basic principle of a sulfur dioxide scrubber system is the removal of SO2 by using its chemical characteristics to combine with water. In some cases, parallel rotating rods create a series of short throat Venturi openings. A series of low pressure, large orifice spray nozzles direct the scrubbing solution into the system. 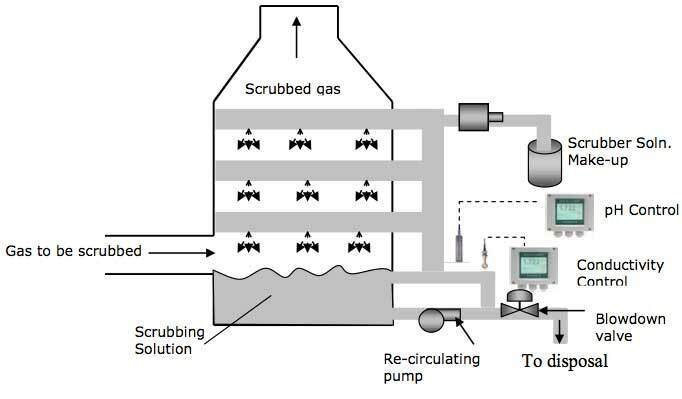 "Scrubbing liquor" is introduced into the system with the flue gas stream. Depending on the design of the scrubber, the gas can flow either concurrent (with) or counter-current (against) the scrubbing liquor. The high velocity turbulence caused by the Venturi openings ensures maximum gas to liquid contact. It is here that the droplets absorb the SO2 as well as impacting and dropping particulates out of the stream. The scrubbed gas is then sent through a demister or re-heater to prevent condensation and exhausted to atmosphere. The solubility of CaSO3 increases greatly as pH decreases or conversely CaSO3 forms a precipitate as pH increases. If pH is too high, "soft pluggage" occurs. Soft pluggage is due to formation of calcium sulfite precipitates which appear as large leaf like masses. Obviously maintenance of equipment that has soft pluggage is easier than with equipment that has hard scale. In many cases where soft pluggage has occurred, it can be melted off simply by lowering the pH (increasing solubility).